The team at McKinley Beach love the festive seasons, as you may well know. Since ground was first broken at the new McKinley Beach community, we’ve embraced all sorts of fun in the spirit of the season including summer giveaways, April Fools jokes, Halloween shenanigans, and, of course, Christmas! 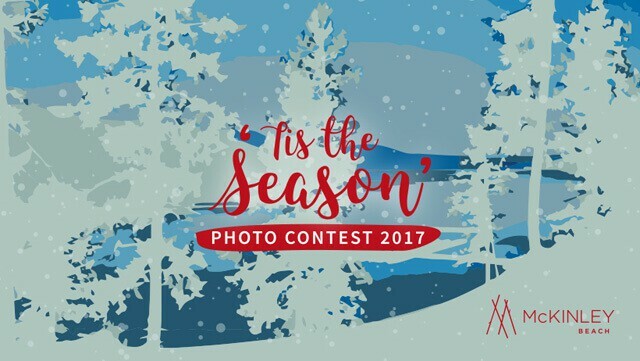 This holiday season is no different and we invite you to join us in celebrating the return of The ‘Tis the Season’ Photo Contest 2017! We want to see your Christmas photos, past or present! And in return you have the chance to win Christmas shopping $$$ to Orchard Park Mall. What do you have to do? Simply head over to our Facebook page, check out your two different chances to win, and share the festive spirit in the comments section. Here are this year’s categories . . .
this year, and why do you deserve to win the grand prize? Runner Up – Tis the Season for Festive Fun! – You must have rights to use the photo/video you’re entering and it must feature yourself or a consenting family member/friend/elf/reindeer. – The contest closes on Friday December 15th, 2017 at 9:00 a.m. with winners to be announced the same day at around noon. – Inappropriate images will be hidden from the Facebook page and disqualified from the contest. – Winner of the grand prize is chosen by jury vote.‘Tis the Season for Festive Fun’ category is awarded to the photo with the most ‘Likes’! – Share this post and encourage others to ‘Like’ your picture! What are you waiting for?! Go and enter today!